Aladdin’s Wishes is an exciting slot game based on Disney’s very own animated classic, Aladdin. The RTG magical online slot features 5-reels, 20 paylines and a progressive jackpot. South African players can expect nothing but fun and huge rewards when playing the Aladdin’s Wishes online slot. Our experts have already tried and tested the game and here’s what they have to say about it. 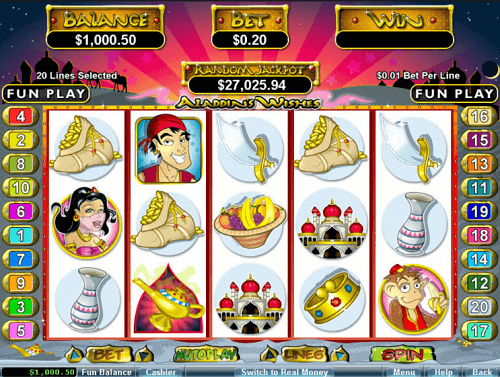 Aladdin’s Wishes is a fairly simple slot game to play. On the reels, punters will find Aladdin characters; Aladdin himself, Princess Jasmine, and the Genie. Other symbols include the magic lamp, carpet, Arabian Swords, the sidekick monkey and other relatable ones. Aladdin represents the Wild symbol. As with other slot games, the Wild substitutes all other symbols on the reels except the Scatter. The magic lamp on Aladdin is the Scatter. So, Aladdin appearing on the reels helps you complete a winning combination and your payouts get doubled. Aladdin only appears on the 2nd, 3rd and 4th reels. Whenever he substitutes a symbol to form a winning combination, players will hear authentic Arabian music. More so, Aladdin’s Wishes slot features a random progressive jackpot. So, the more you spin, the more it builds up and the greater your chances of winning. Don’t play at maximum bet level in order to trigger the jackpot. SA players can win up to 50 000x their total bet on Aladdin. Moreover, Aladdin’s Wishes has a bonus feature of the same name. This feature can be triggered when punters land three or more magic lamps anywhere on the reels. During the feature, you will have an option to choose either three or four out of five magic lamps which have awesome rewards. You can earn either 25 free spins or get awarded credit prizes between 2x to 100x the triggering bet. The Aladdin’s Wishes feature can be retriggered during free spins. Aladdin’s Wishes is a slot game which ticks all the right boxes. The game has a charming design and beautiful classic sound. It is also a simple game to win. We loved the Aladdin’s Wishes bonus game which awarded free spins and the fact that it can be re-triggered. By the time of writing, the randomly awarded jackpot was at R3 883.71 and could build to more than that. Aladdin’s Wishes has an amazing payout of 95%.